Apple discontinued Safari for Windows in 2012. Windows 10 does not support any version of Safari for Windows, but Window 8, Windows 7, Windows Vista, and Windows XP SP2 and SP3 support the final 2012 version. One of the great things about Safari for Windows is its minimalist approach when it comes to the user interface. The old menu bar that users became accustomed to is now hidden by default, providing more real estate for web pages. For some, however, change does not always equate to forward progress. For those of you who miss the old menu bar, have no fear: It can be reactivated in a few simple steps. Once the menu bar is enabled, you can find all of its submenus, such as File, Edit, View, History, Bookmarks, Window, and Help. The Develop menu is also shown between Bookmarks and Window if you've enabled it through Safari's Advanced settings. The steps for showing Safari's menu bar in Windows are short and sweet, and if you want, you can hide the menu bar again in just two quick steps. With Safari open, click the Settings button at the top right of the program. It's the one that looks like a gear icon. When the drop-down menu appears, choose Show Menu Bar. 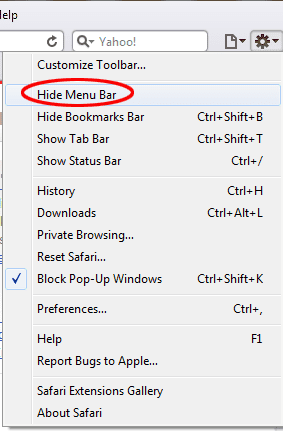 If you want to hide the menu bar again, repeat this process but this time choose Hide Menu Bar. You can accomplish the same thing from the View menu at the top of Safari screen.